In order to be certain about my conclusions, I decided to do some experiments. The goal was to see if I could figure out why I don’t have a problem peeling my hard-boiled farm eggs when so many other people do. I don’t know about you, but when I want or need a boiled egg, I don’t want to spend a great deal of time getting such a simple task done. Many of the ideas I read are time-consuming and don’t work well, or work at all. As you know, I don’t refrigerate my eggs, but for these experiments, I refrigerated the eggs I used because most people in the U.S. do feel they have to refrigerate their farm fresh eggs. See our post About Egg Washing and Storing for more information. I scoured the internet to find the most popular suggestions and decided to give these a try. Steaming them – This worked so-so, but more work than the way I do it and I didn’t have consistent results. However, it was easier to peel than other methods I tried. Adding vinegar to the water – didn’t work for me. Adding baking soda to the water – nope, not effective, but maybe a little better than vinegar. Using a pin to prick the egg before boiling – well, I don’t know if my holes were too big or if it just doesn’t work, but it was disastrous. The egg oozed out the ends. Letting the eggs age 2-3 weeks – Well, who wants to be sure they’ve set eggs aside in order to be able to have aged ones on hand every time you need or want boiled eggs. I didn’t try this one because I don’t have eggs to set aside for that long. Eggs just don’t hang around our house for long. I know from experience that older eggs work better because they have had time for the inner membrane to pull away from the shell due to evaporation. This usually begins to take place after 5 days, depending on how you store your eggs. Boil the egg; run it under cold water or put it in ice water until it’s completely cool, the directions say at least 15 minutes; then running it under hot water again, or placing it back into a pot of boiling water until the shell is warmed up again…whew…time consuming and redundant – at least to me. It did give better results than the others. Boil the egg for 12 minutes; drain the water; shake the pot to crack the eggs, the directions say to be sure the entire shell of each egg is cracked; let them cool in cold water and then try to remove the shell. If you can’t, they suggest you run it under hot water again…and still doesn’t work much better. I decided to see if refrigeration of the eggs plays any part in the difficulty so I used refrigerated eggs and cooked them the way I always do. The first thing I did was to put an egg in the refrigerator overnight. I added the cold egg to boiling water; boiled it for 12 minutes; let it sit in the hot water for another 3 minutes (I like 15-minute eggs). After rinsing it in cool water, I attempted to peel it. It was disastrous. Next, I placed a cold egg in cool water and brought it up to a boil and cooked it just as I usually do. I rinsed the egg in cold water and again attempted to peel it. And I do mean attempted. Of course, in the interest of being fair, I boiled eggs the way I always do it. The egg peeled just fine immediately after boiling and rinsing with cool water. I boil eggs the way my grandmother taught me which makes sense because she taught me most of what I know about cooking. How lucky does that make my family? 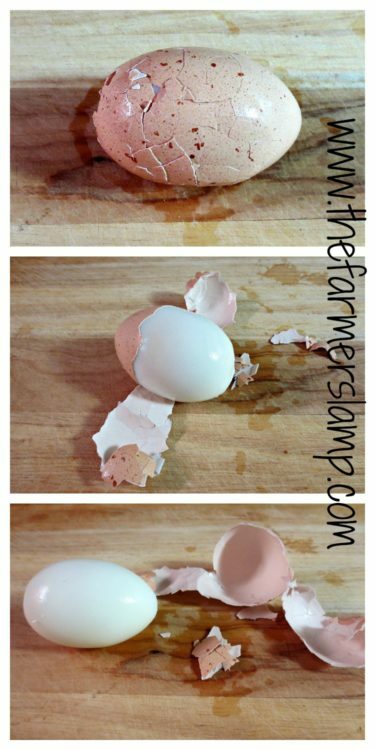 🙂 Now, if you’re happy with the way your method of peeling boiled farm fresh eggs works, then that’s great. I’m glad you found a way that works for you. 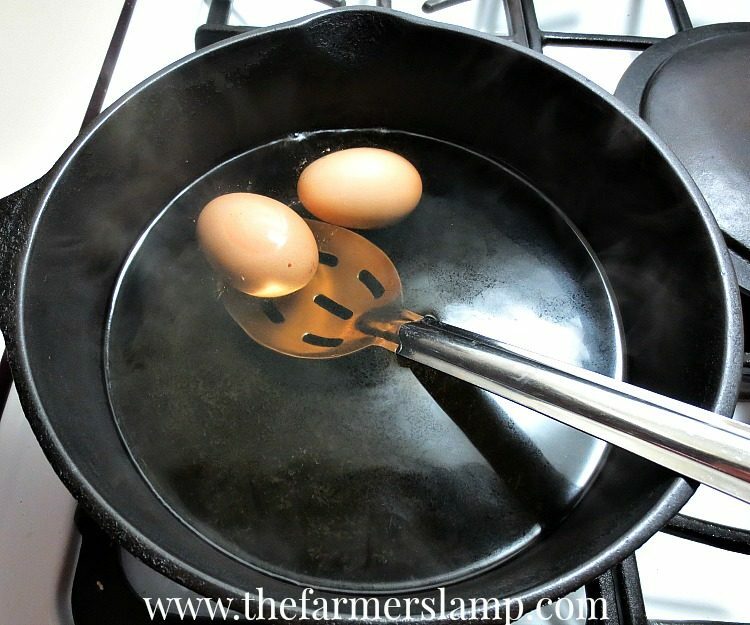 For those who are looking for an easy, reliable way to peel boiled farm fresh eggs, then I can help. The conclusion I reached is that I don’t have a problem peeling boiled farm fresh eggs because my eggs are not refrigerated. My eggs are at room temperature when I put them in the boiling water. Turn off the heat and let them sit in the hot water for 3 minutes longer (for 15 min eggs, since that’s how we like them). Pour off the boiling water. Rinse the eggs in cold water just long enough to cool the shells enough for you to touch them safely; I just run cold water into the pot to cover the eggs and then pour it off. Crack the egg on the round bottom and remove the shell. Success! So the secret is just about the temperature of the egg. But what if I want to refrigerate my eggs? The egg just needs to be at room temperature, which at my house is 65-72F. If you do want to keep your farm fresh eggs in the frig, you just need to set them out far enough in advance to allow them to get to room temperature. This should take 2-4 hours depending on the humidity level. 🙂 Once they are at room temperature just use the trouble-free, easy, reliable method we just shared. 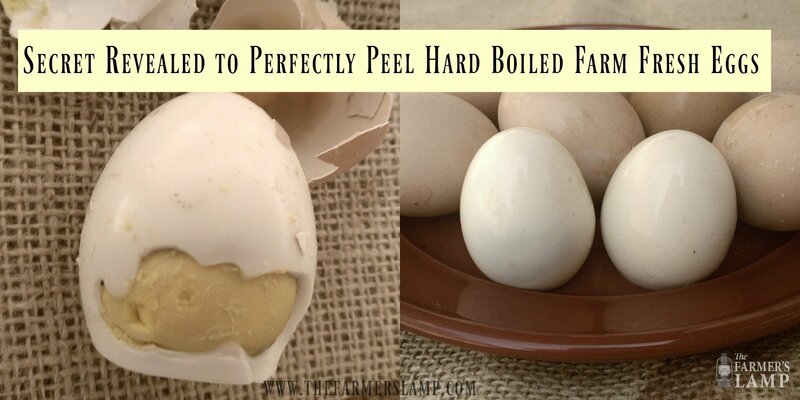 Do you have another successful way to peel boiled farm fresh eggs? Or a tip or trick you learned from your mother or grandmother? Be sure to share with us by leaving your comments, experience, and suggestions below. Remember, you can always reach me by using the Contact Me page. I do steam mine and have had no problems since starting to do so. Eggs can be cold or room temperature, but I fill the base of the pan with cold water, place the eggs in the steamer and then bring the water to the boil. 12 minutes from cold is the perfect yummy runny yolk, 13-4 minutes to a firm soft boil, 15 for hard. Run under some cold water until cool enough to handle, then peel. So easy, and it doesn’t matter if the eggs are from the fridge or straight from the girls ! “pre- chicken ranch” days I was boiling old store bought ones!! Melinda, Thanks so much for taking time to comment. I had a lady tell me one time that her father told her to buy store eggs for boiling because “you can’t use them yard eggs for boiling”. She always thought that they were uneatable in some way. When she told me this, we both had a good laugh and she was happy to stop buying store eggs for boiling and use her yard eggs! I’m glad you liked the article. I use a microwave boiler. If you prefer to keep your eggs refrigerated this works perfectly. Follow the directions for your microwave wattage. I cook mine on high for 9-1/2 minutes and run cold water over them( as per the directions) and they are easy to peel. I believe I purchased mine at Kroger a couple of years ago. It’s in the shape of an egg… 🙂 good luck! MY MOTHER USED TO ADD A FEW DROPS OF OIL TO THE BOILING WATER WITH EGGS AND ADD SALT IF ANY SHELL IS CRACKED AS SALT IN THE WATER CONCENTRATES THE WATER TO STOP THE LESS CONCENTRATED CONTENT OUTFLOW OF EGGS. AS FOR ME, I COOK THEM IN A PRESSURE COOKER FOR ONE WHISTLE TIME AND THE SHELLS PEEL WITH EASE. TRY AND LET ME KNOW. Anupama, Thanks so much for taking the time to share your experiences and your mother’s trick with us. I’ve never known anyone who used a pressure cooker for boiling eggs so I am glad you shared with us. Thanks for sharing your experimentation – Saves a lot of eggs! I like to boil mine a dozen at a time for grab-and-go breakfasts or to satisfy a sudden whim for tuna salad. I store them in the shell with mixed results come peeling time. Any thoughts about storing boiled eggs? If, how, and how long? Thank you! Carol, Thanks so much for taking the time to share your way of boiling eggs and to ask the question. The rule of thumb for keeping boiled eggs is to use them within one week. I personally don’t keep them longer than 4 days, but that’s just because my grandmother taught me that and I’ve always found her advice to be sound. Not that I’m prejudiced or anything 🙂 I would definitely keep them in the frig too, but if I have extra eggs, I peel them and put them in a sealed glass container or storage bag until I’m ready to use them. Good morning! I have been on a life long search for the best way to peel eggs. I have always had trouble when others find it easy, and I think I am finally finding out why. I did try the steam method, and had great perfection when I peeled them just as they were cool enough to handle. I figured out that the problem exists when I steam/boil/bake/etc. and THEN refrigerate them! We love having HB eggs on hand do I always do 6-8 at a time. It’s when they have already been cooled for 24+ hours that my problem arises. Any thoughts? Some other fun ways I found: hard BAKED eggs – preheat oven to 400 F, place eggs in muffin tin, and bake for 25 minutes (worked, but leaves “burn” marks on the whites which some people might not like. BLOWN EGGS: just find this on YouTube. I actually DID get this to work! But when I tried to show my husband it was a disaster, so it may have just been a fluke? Samantha, It certainly seems you have tried all kinds of ways to perfectly peel farm fresh eggs. The steam method worked OK for me, but seemed a little more work, at least to me. If I boil extra eggs, I go ahead and peel them and store them in a glass bowl with a lid or in a storage bag until I’m ready to use them. They’re already peeled so that makes it even nicer. 🙂 The baking option didn’t work well for me and I’m afraid I would be one of those people who don’t like the “burn” marks from a muffin tin. I saw a video that sounds like that one, but I didn’t try it. I really didn’t think it work! I’m glad you were willing to try it and that it worked for you. I’m sure it didn’t work the next time just because you were trying to show your husband. 🙂 I thank you so much for stopping in and sharing all your experiments with the rest of us! We’re been raising chickens for 9 years now, and I thought I had tried every method out there to get the perfectly peeled boiled egg. This not only worked better than anything else I’ve tried, but also took significantly less time. We sell eggs, and the biggest (actually the only, other than the lady who says the eggs are too rich) complaint we get is how hard fresh eggs are to peel. Our clients will be as excited about this as I am! Thank you so much for sharing!! Heather, Yay! I’m so glad you found something that works for you and that I got to be of some help to you and your customers. That’s why I’m here. You are such a dear to take the time to let me hear from you. Thank you. This is fascinating. I love kitchen science! We don’t have the luxury of farm-fresh eggs but I did know that room temperature is best to start with. I also like to turn the carton on its side to center the yolks for deviled eggs. I prefer to hard-cook my eggs rather than boiling them. I think the texture is smoother and the color stays a cheerful yellow rather than hinting to green but that may be a problem with store bought and not with homegrown. I bring the water to a boil, slip the eggs in and then turn the heat off but leave the eggs in the pan for 20-22 min depending on size and color. White eggs seem to take less time, The extra large brown eggs we get here usually take 22 minutes to relatively firm but still moist. Heavier pans should be removed from the stove top but I leave my aluminum-bottom pots on the burner as they cool too quickly otherwise. I’d be interested to know the difference with gas stoves and other types of pots. I usually let my eggs cool in cold water for five minutes or more but I will try peeling them quicker on your advice. Most of how I cook my eggs I learned from an old issue of Cook’s Illustrated. I’ve been steaming mine for years. 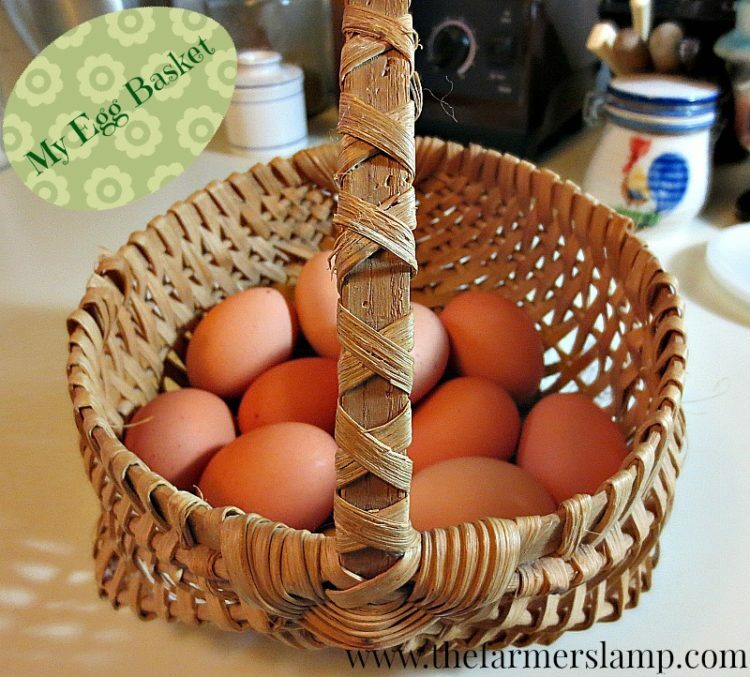 What’s simpler than putting a dozen eggs in a steamer basket over a pot of boiling water? Then right into an ice bath – a bowl full of ice water. I think your steaming didn’t work because you didn’t follow up with the ice water. Mine peel perfectly, every time, whether from the fridge, on the counter, laid that morning. Lisa, I’m honored that you stopped by to comment. I said “Wow! Lisa commented on my article,” thank you. You’re probably right, I did not use ice water to dip mine in, just cold water (ours comes from a deep well). Some of them peeled OK, but some did not. Thanks so much for sharing your insights. I don’t know the science behind it but I do believe its the ice bath that helps with the peeling whether you boil or steam. Don’t know tho, I haven’t actually boiled eggs for some time now! I boil mine all the time, but never use ice. Just run them under cold water until I can touch them without getting “hot hands.” Never had any problems, that’s why I decided to do some experimenting. I enjoyed the testing process, although sometimes I felt a little wasteful of the girls’ hard work 🙂 If I try steaming again, I’ll definitely use ice water. I have been having a huge problem with peeling my boiled eggs. I thought it was just because they are farm fresh. I do keep them in the fridge, but only because I do not have the counter space to leave them out. I heard about the baking soda trick and added some to my water last time I made some. Actually worked like a charm! I think next time I will try them at room temp and see how that goes. I would rather not waste the baking soda if I do not have to! Thanks for the tip! Kamay, I’m so glad you found the article helpful. I know it will work for you. My friend who lives in an RV, keeps her eggs in a hanging basket for space. I thought that was ingenious. Thank you for taking the time to comment.